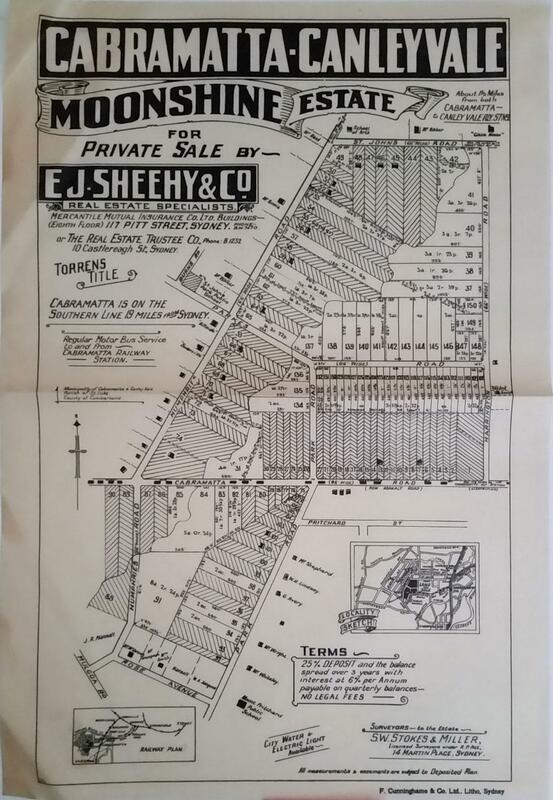 F. Cunninghame & Co. No Date, Sydney - The poster advertises "About 1 1/2 Miles from both Cabramatta & Canley Vale Rly. Stns." & "Cabramatta is on the Southern Line 19 miles from Sydney". The estate is bordered by St. John's Rd, Humphries Rd, Harrington Rd., Cabramatta Rd, Park Rd, Rose Avenue and Humphries Rd. 29.2 x48.2 cm & margins. Black printed sales poster on cream paper, title at top, oddly without a date, but ca. 1930; map below. With inset maps of the railway plan and the locality. This is a later edition of the ca. 1930 subdivision poster, with cross hatching where we assume are sold lots, and a different draftsman.